Energee Entertainment. 2000. Director: Karl Zwicky. Music: Chris Harriot. CD (ST) BMG. 74321784302. 2000. 01: It's A Wonderful Day - Geoffrey Rush. 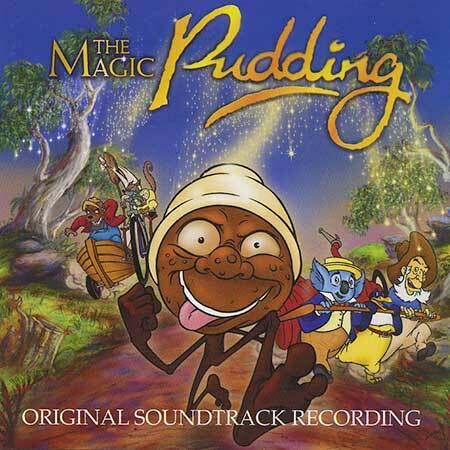 02: Albert, The Magic Pudding - John Cleese, Sam Neill, Geoffrey Rush & Chorus. 03: If I Had You - Kate Ceberano. 04: I Want You Back - N Sync. 05: The Puddin' Owner's Song - Sam Neill, Geoffrey Rush & Hugo Weaving. 06: My Heart Beats - Toni Collette. 07: Flying Without Wings – Westlife. 09: It's Worse Than Weevils - Sam Neill, Geoffrey Rush & Hugo Weaving. 10: Save the Town - Sam Neill, Geoffrey Rush & Hugo Weaving. 11: Eternal Flame - Human Nature. 12: In the Underground Tonight - Jack Thompson, Mary Coustas, Dave Gibson & Chorus. 13: Friends - Merril Bainbridge. 14: The Magic Pudding - Rolf Harris. 15: Now I Can Dance - Tina Arena. 16: A Slice of Pudding - The Magic Pudding Orchestra.